New 5 Axis Horizontal CNC Machine - TMB Patterns - Manufacturers of high quality tooling for the food packaging industry. TMB Patterns – Manufacturers of high quality tooling for the food packaging industry. 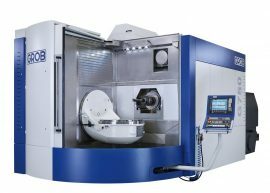 Our latest investmant within TMB Patterns is a new Grob G750 horizontal 5 axis CNC machine, the first and largest machine that Grob have supplied into England, with a working area Ø1200 x 930.